Hello and WELCOME to WILL GRAYSON, WILL GRAYSON FIRST DISCUSSION POST! Thank you to all who have signed up for our third Read-A-Long this year, I hope you guys enjoyed reading Divergent and Delirium with us and are having just as much (or more!) fun with Will Grayson, Will Grayson! Today we'll be discussing chapters 1-5 of Will Grayson, Will Grayson! 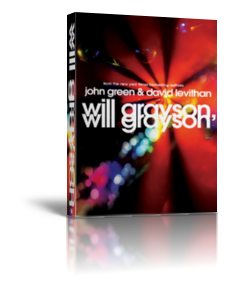 - We meet Will Grayson and learn a little bit about his life and friends (Tiny Cooper). We also meet Jane and learn that Will's feelings for Jane are rather.. complicated. - We meet the other Will Grayson and learn a bit about his life. We also learn that he lives with his mom and their relationship seems to be very strained. We meet his friend, Maura and get to experience the weird dynamics of their "friendship". We also learn about Isaac, a boy that Will met on-line and got romantically involved with (long-distance romance). - Will attends GSA meeting, organized to discuss Tiny's musical. Tiny is playing a match-maker, trying to make sure Will and Jane will hook-up. Will tells Jane he is not interested in starting a relationship. Jane helps Will get a fake ID so he can go to a concert. - Maura asks Will if he's gay. Will doesn't like her being nosy. They get into a fight. Later on, she stops by his house and they work things out, though Will doesn't admit to her that he's gay. - Will and Isaac decide it's time for them to meet. They pick a date 6 days from now. - Tiny asks Will to sing in his musical. Later on, together with Tiny and Jane, Will goes to Maybe Dead Cats concert, but doesn't get into the club because of the wrong birth date on his fake ID. He ends up going into an "adult store" to kill time. He buys a magazine called Mano a Mano there. When I was little, my dad used to tell me, "Will, you can pick your friends, and you can pick your nose, but you can't pick your friend's nose." I am constantly torn between killing myself and killing everyone around me. those seem to be the two choices. everything else is just killing time. i do not say "good-bye". i believe that's one of the bullshittiest words ever invented. it's not like you're given the choice to say "bad-bye" or "awful-bye" or "couldn't-careless-about-you-bye". every time you leave, it's supposed to be a good one, well, i don't believe in that. i believe against that. You like someone who can't like you back because unrequited love can be survived in a way that once-requited love cannot. 1) What do you think of the style of writing so far & how it changes for each Will? 2) Do you have a favorite character yet? If so, who? 3) What do you think will happen when Isaac & Will meet? Can you see Jane & Will getting together? 4) What do you think about the strained relationship between Will and his mom? Why is Will so negative towards his mom? 5) What do you think about Maura? Do you think Will can/should trust her and tell her that he's gay? How do you think she would react? 6) Do you like the alternating POVs? Which narrator do you prefer and why? These are all the questions we have for you today! Please leave your answers in the comments below. Feel free to break them apart (1 comment per 1 answer! ), or omit the questions you do not feel like answering! I am looking forward to discussing Will Grayson, Will Grayson with you guys! Meanwhile, happy reading and remember Discussion Post for CHAPTERS 6-10 will be posted over @Bookish Comforts!